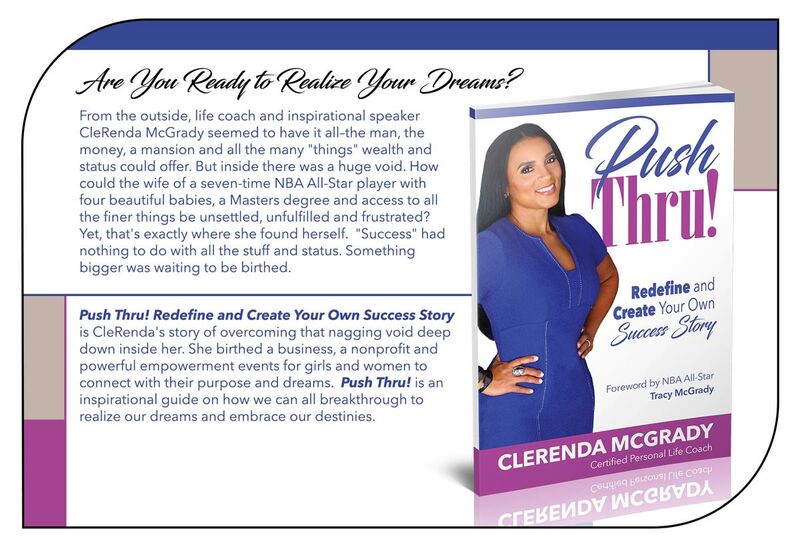 CleRenda McGrady's 2017 Push Thru Vision Tool. CleRenda McGrady finds purpose in making a difference in the lives of women. Audiences leave inspired and enlightened after experiencing CleRenda McGrady, wife of seven-time NBA All-star legend Tracy McGrady and mother of their four children. She is founder of the non-profit women's and girl's empowerment organization, Project P.U.S.H. She holds both a Bachelor's Degree in Communications and a Master's of Education and Speech Pathology. An engaging author, vlogger, former TV host, and philanthropist, CleRenda uses her voice to focus on what matters to her most: encouraging and challenging women to live beyond their inner limitations and motivating girls and teens to believe they are unstoppable. Recognized as one of the "Top 30 Influential Women of Houston," CleRenda is a successful entrepreneur and certified life coach. Inspirational speaker Lindsay Clark is highly sought after for her wit, wisdom and relatable delivery. As a mother of two, she enjoys sharing the challenges and triumphs she has experienced while rearing her son and daughter. Lindsey is often found consulting women in their pursuit of purpose while still functioning as wives and mothers. She works daily alongside her husband as lead pastors for two Triumph church campuses in Nederland and Beaumont,Texas. Jan Hargrove is a consultant and former Adjunct Professor at the University of Houston for eight years. Her gift is in teaching how the body communicates to others. She’s unlocked the secret to “reading” customers, family, students, in fact, everyone around you. Author of Let Me See Your Body Talk, Freeway of Love, Judge The Jury and Strictly Business Body Language, this popular speaker, distinguished educator and national talk-show guest reveals all the “hidden messages” we use in our everyday life that can dictate our success or failure. Following whole-heartedly after her purpose, Amanda Hebert works to “Spread Joy” to all she meets. Born and raised in Houston, Amanda took to the stage (church stage that is) at age 11 singing, acting and loving the spotlight. She has held several different jobs in and outside of the church in the last several decades, finally realizing it was time to get serious about the funny. Amanda's perspective on life, family and medicine commercials will keep you in stitches. She will crack you and herself up. You are sure to laugh all the way to a happy heart knowing you have received good medicine. Verenda Hodge went from being a homeless hostage of drug addiction to an energetic, successful Realtor® and sought after Group Counselor for Star of Hope’s, NEW HOPE program, mentoring to hurting, homeless, and hopeless women. She is a faithful member of Golden Rule Broadcasting, a nonprofit organization dedicated to bridging the gap in communication to seniors, the underserved and remote populations. Audiences leave inspired and refreshed after hearing Verenda share from her journey. Lereca Monik is a Relationship Manager for the American Red Cross, and holds a Bachelor's of Science and a Masters of Public Education from Texas Southern University. A native of Vancouver, Washington, she was crowned Ms. Texas America 2016 and is the proud mother of her daughter, Lereine. Her signature motto is, "You Were Born for Greatness. Embrace Your Uniqueness. Now Go Be Great!" YOU REIGN! Special Thanks to our Girl Chat Panelists! Yolanda Adams is a singer, record producer, actress, and multiple award winner of Grammy, BET, Soul Train and NAACP Image Awards. The singer and former schoolteacher, whose love of children's causes is almost as legendary as her singing, eagerly embraces the social responsibility that comes with the blessings of success. The Houston native recently returned to radio on Houston's new Amazing 102.5 FM with the daily "Yolanda Adams Morning Show." heresa’s passion for health and helping people started at a young age. She was diagnosed with a heart condition as a child and began her lifelong journey to stay healthy and physically fit. At 40, she took the U.S. Open title in body building, and in 2010 held the titles of Mrs. Houston U.A., Mrs. Texas U.A., and was the 1st runner up for Mrs. United America. Theresa has owned businesses for over 20 years and is currently a lifestyle and health advocate. Tomeka is a native Texan and Motivational Speaker who found her God-given calling while matriculating at Texas Southern University as a Communication Major. She has been helping, empowering, loving and preparing people for their PURPOSE, PLAN and PLATFORM long before being crowned Ms. Black Texas 97'. She’s the founder of a foundation and media production company. Her OVERALL message is one of enormous FAITH to accomplish DREAMS and GOALS despite feeling "OVER THE HILL". Jacquelyn Aluotto is a producer, director and activist dedicated to saving shelters for homeless people through the eradication of poverty, violence, and abuse across America. She directed and produced the Award Winning Documentary “Not In My Backyard” with never seen before footage of abused and homeless women and children. She is the recipient of many awards, including the 2016 “Women Making A Difference Award” honored by the Buffalo Soldier National Museum. "Our mission is to inspire, ignite and empower teens and women to fulfill their dreams and shift from where they are to where they want to be." © Copyright 2016 - Project P.U.S.H. All Rights Reserved. Email our event coordinator Danielle Pollard at danielle@clerendamcgrady.com or call 404.372.9698. Website, marketing and consulting by DP Marketing Strategies.